Lexington, KY – The Mt. Eden Vaulters, of Saratoga, Calif., dominated the first day of the Kentucky Cup Vaulting at the Kentucky Horse Park. 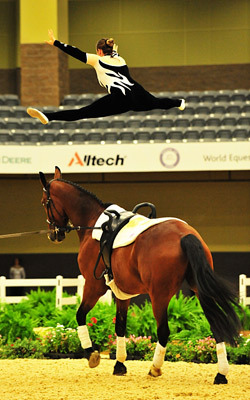 The Kentucky Cup is the vaulting test event for the 2010 Alltech FEI World Equestrian Games next September. Vaulters representing the Mt. Eden team, of Saratoga, Calif., are leading the all four individual divisions and both of the team competitions. In today’s individual competitions, each vaulter performed exactly the same one-minute routine of seven exercises, while in the team competition each of the seven members performed twice, performing a total of four exercises each. Judges from Germany, Italy and the United States evaluated them. Mt. Eden vaulters are standing first and second in the women’s CVI 2*, from a field of 20 starters. Mary McCormick, 26, of Woodside, Calif., nipped Megan Benjamin, 21, of Saratoga, Calif., by 7.826 to 7.781. Benjamin is the reigning World Champion, and McCormick is an accomplished international competitor. Shannyn Poer, 23, of Venice Beach, Calif., claimed third, scoring 7.463. “I’m, obviously, very excited to be on top, and being here for this test event makes me feel a lot more prepared for the 2010 WEG,” said McCormick. Seasoned international competitor Kenny Geisler, 28, of Sunnyvale, Calif., established a sizeable lead in the men’s 2* division, scoring 6.644. Kristian Roberts, 16, of Moss Beach Calif., earned 6.400 to grab second from Erik Martonovich of Las Vegas, Nev. (6.244). Martonovich has returned to competition while continuing his career training horses for and performing with them in stage shows. “This was one of the best sets I’ve been able to perform in years,” said Geisler. With a smile, Geisler attributed Mt. Eden’s sweep of the day to “a great organization. We have a lot of people helping us out, but the most credit goes to our coaches, Emma Seely and Jessica Ballenger. They’re always on the prowl for new and better horses and new ideas,” he said. In the 2* team event, the Mt. Eden Sun Team turned in a clean, smooth and professional performance on Sampson, a horse they’d never vaulted with before. The horse they’d planned to use became sore yesterday. Their performance put them more than 1 point ahead of the Woodside Vaulters. Kyra McCarty, 17, of San Mateo, Calif., started the Mt. Eden sweep by claiming the narrowest of leads in the CVI 1*. Both she and Rachel Bublitz, 16, of Parker, Colo., earned an average score of 6.300, but McCarty placed first because she scored higher in the tie-breaking exercise. Karly Frankel-Newman, 14, of Menlo Park, Calif., is just behind in third, scoring 6.289. A total of 33 women started the 1* division. Joey Gadd, 14, also a member of the Mt. Eden team, said that his horse, Lanson 16, liked the arena too. “It’s very open. It doesn’t seem like a horse-eating cavern to them,” he said. Gadd said that his horse’s performance was the main reason he took a narrow lead in the men’s CVI 1*, scoring 5.878 to edge Shawn Ricci, 31, of Shawsville, Va. (5.874). Clay Thomas, 14, Newtown, Va., claimed third (5.626) in the three-man field. “I was a little bit nervous today, but I think I did pretty well in my first international competition,” said Gadd. The Mt. Eden Eclipse Team, which includes McCarty and Benjamin, suffered no mental or performance blocks as they took a decisive compulsory lead from the Woodside Vaulters. The seven-member Mt. Eden team scored an average of 6.252, while Woodside scored 5.477. The Mt. Eden Eclipse Team showed impressively crisp timing as each member vaulted on and off their horse Giovanni, and each team member demonstrated stronger, more assured poses than their rivals. McCarty said she prefers the team competition to the individual. “If something goes wrong [for me] in the team competition, I get a lot more upset because I’ve let six other people down. I put a lot more fight into the team,” she said. Almost all the vaulters praised the Ottosport footing that the organizing committee placed over the dirt arena floor for this event. This is the indoor version of the Ottosport footing that’s used in the outdoor arenas at the Kentucky Horse Park. “It’s the best vaulting footing in the world,” said Benjamin. “This footing is much more supportive than what we usually vault on. I like it very much,” said Geisler. Eight countries will go head to head at the Kentucky Horse Park to compete in Kentucky Cup Vaulting, the official test event of the 2010 Alltech FEI World Equestrian Games. The Kentucky Cup Vaulting test event will be held July 30 through August 2 in the new indoor arena at the Kentucky Horse Park. Competition will begin daily at 8 a.m. and will resume in the afternoon at 1 p.m. Admission is free to the public, and parking is $3 during the day and $5 after 5 p.m. Doors will open one hour prior to competition. LEXINGTON, KY-Team USA rider Tom McCutcheon of Aubrey, TX, won the individual final in Kentucky Cup Reining, the first test event for the 2010 Alltech FEI World Equestrian Games. LEXINGTON, KY—The World Games 2010 Foundation, Inc. today announced the American Quarter Horse Association as the Official Reining Breed Sponsor. Reining will be one of eight world championships contested at the Games, which will be held at Lexington’s Kentucky Horse Park on September 25-October 10, 2010. As the Official Reining Breed Sponsor, AQHA will assist with the promotion and coverage of Reining during the 2010 Games, and will be featured in the Equine Village. In addition Reining will be prominently featured during NBC’s 90-minute broadcast of the Games’ opening weekend. As the 2010 Alltech FEI World Equestrian Games come to Kentucky, the sport of reining is sure to enjoy a sort of “homecoming” in the United States as the only western discipline recognized by the FEI. Plans are under way to feature reining in new and exciting ways in 2010, including a newly approved schedule format – allowing for more public sessions of the discipline. “AQHA is so proud to sponsor this prestigious event, and we are excited it is being held for the first time in the United States,” said AQHA President Jim Helzer. “Although AQHA is an international organization with members and horses around the world, the majority of our membership and horses reside here in the U.S.A. Having the World Equestrian Games in Kentucky gives our members a great opportunity to participate and see this event firsthand. LEXINGTON, KY-With a great sense of anticipation, Team USA’s Aaron Ralston made history as he entered the ring as the first athlete ever to compete in the Kentucky Horse Park’s new indoor arena in Kentucky Cup Reining, the first test event for the 2010 Alltech FEI World Equestrian Games. For the test event, Team USA fielded a seasoned team featuring four WEG Gold Medalists. They were led to the win by Shawn Flarida, 40, of Springfield, OH, double Gold Medalist in reining’s WEG debut in 2002. Flarida received a score of 370.00 from the five-judge panel for his ride on Smart Spook, an 8-year-old, AQHA Sorrel stallion owned by Rosanne Sternberg of Aubrey, TX. LEXINGTON, KY-The first test event of the 2010 Alltech FEI World Equestrian Games begins today as Kentucky Cup Reining slides in the new indoor arena of the Kentucky Horse Park. Kentucky Cup Reining will be the first competition held in the park’s new arena. Kentucky Cup Reining is a CRI4* competition, officially sanctioned by the International Equestrian Federation (FEI), featuring teams from Canada, Mexico, and the United States. The Nations’ Cup team competition will be held July 21 at 10:00 a.m., and the Individual Final will be held Thursday, July 23 at 7:30 p.m. The Kentucky Cup Reining competition is also an opportunity for organizers of the 2010 Games to test planning and preparations well in advance of next year’s world championships. Many 2010 Games sponsors are assisting with Kentucky Cup Reining, including Alltech, John Deere, Rood and Riddle Equine Hospital, the American Farriers Association, UK Healthcare, Fortune Realty and Pieratts. LEXINGTON, KY (July 15, 2009) Today, the Kentucky Horse Park secured it’s position as the world’s leading equestrian venue with the opening of a $45-million, state-of-the-art Indoor Arena. “If one were to chronicle the highlights of the past decade at the Kentucky Horse Park, a decade already distinguished by significant accomplishments, the opening of our new Indoor Arena stands as the crowning achievement,” noted John Nicholson, Executive Director of the park. The arena was designed by GBBN Architects (offices in Lexington and Louisville), and built by DW Wilburn, a Lexington company. It was designed specifically for the park, after consultations with the leaders of numerous equestrian disciplines, so that it would be the most versatile and user-friendly facility possible. While designed for equestrian competition, the arena will also be used frequently for other types. Special features include 5,700 stadium seats and nine suites with 200 suite suite seats, a 135 x 300-foot event floor (equal to one football field or four basketball courts) with special equine surface, 20,000 square feet of exhibitor space, six concession areas, a warm-up barn, outdoor warm-up ring, high-tech sound system, 568 parking spaces, and bathrooms with 91 stalls. Additionally, the fundraising arm of the park, the Kentucky Horse Park Foundation, is in the process of constructing a three-barn complex with 312 stalls adjacent to the arena, to provide stabling for the thousands of horses who will compete in the arena. These state-of-the-art barns, funded entirely by the private sector, will allow the Kentucky Horse Park to serve as a competition facility 365 days per year, making the park even more attractive to potential horse shows currently held in other states. The arena is already booked with approximately 30 events. Among the events contracted to use the arena is the Alltech FEI World Equestrian Games in 2010. The first event to take place will be next week’s WEG Reining Test Event, July 20-23.